I am going to add here all the programs that helped me during a BI implementation. I am not going to talk about big professional solutions like NPrinting, QVSource or QVReport that everybody knows and love, but about small and handy tools. Who doesn’t need to send email? Daily data, alerts or reports, embedded or attached, email is still the most used electronic way of communication. Sometimes, the managers finds more convenient to receive a short email with the specific KPI’s and just have a quick glance. They will use the heavy full-featured BI application only if there’s the case. Or sales agents can receive a daily list of customers that need attention. The scenarios are endless and sometimes sending small reports saves you time and expensive BI licences. One of the best free command-line tools in this category is BLAT. Beside the numerous options, x86 or x64 versions, it has the cool capability of sending HTML formatted emails with embedded files in the body. You need to define a HTML template and use this to send professional looking reports or formatted to fit a smartphone display. There was a time when I needed to run a macro (export a chart) on a regular basis. First thought was to run the macro on a document OnPostReload event. The problem was that I needed to run it on a QlikView server and the server does not trigger the event. OK, no problem, I will call the macro from the LOAD script! The thing is that the macro was trying to access an interface object (chart) which is not available at LOAD time. 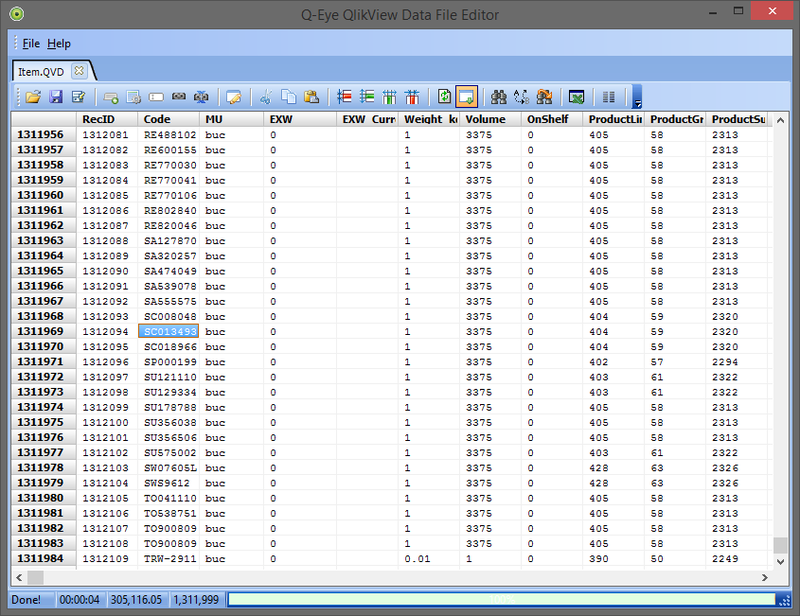 I chose to run the document from QlikView Desktop using Task Scheduler. But I encountered a lot of problems running a .BAT file. So I had to search for a good task scheduler that could run in service mode and I founded here. JIT Scheduler is a very good free tool that helps you schedule your tasks. 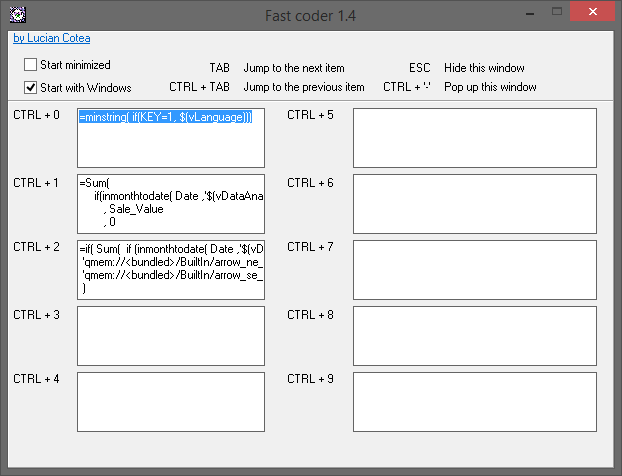 Since we are still waiting for that in QlikView desktop, I build this small tool to help me paste code without using the mouse. Now, whenever you need to paste a saved piece of code, just press the corresponding CTRL + x combination. Change QVD structure or just take a peek inside, Q-Eye is the tool for the job. It also has a portable version. As some of you know, we can manipulate the interface objects by changing the corresponding XML file like I described in a previous post. If you want to change a specific color (customer brand), common properties like borders or references to an object, no problem! Using a “Search and Replace” tool like the one from Funduc we can change specific properties in one step. Run it as a service! Ever needed a program to autorun on a server but it wasn’t built as a service? Using this small service I’ve build, you just enumerate (.conf file) all the programs that you need to autostart even if nobody is logging in. Do you have a .qvw example that uses Blat?